On this Raksha Bandhan, leave an impression on the hearts of your dear ones by gifting them this Rocking Rakhi, Pooja Thali with Dry Fruits for Auspicious Occasion that comes with a free Rakhi, Roli Tilak and Chawal. This beautiful Hamper is composed of Nicely Gift Wrapped Designer Pooja Thali (Thali Size 8 to 9 inch) with 250 Gms. (Gross Weight) Assorted Dry Fruits and 1 Free Rakhi. Designer Pooja Thali (Thali Size 8 to 9 inch) with 250 Gms. 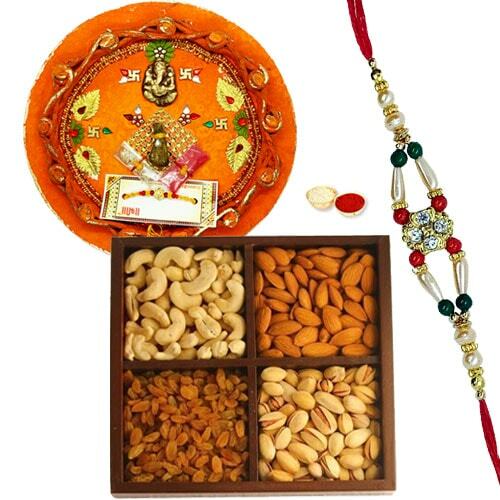 (Gross Weight) Assorted Dry Fruits and 1 Free Rakhi, Roli Tilak and Chawal. Designer Pooja Thali (Thali Size 8 to 9 inch) with 250 Gms. (Gross Weight) Assorted Dry Fruits and 2 Rakhi, Roli Tilak and Chawal. Designer Pooja Thali (Thali Size 8 to 9 inch) with 250 Gms. (Gross Weight) Assorted Dry Fruits and 4 Rakhi, Roli Tilak and Chawal. Designer Pooja Thali (Thali Size 8 to 9 inch) with 500 Gms. (Gross Weight) Assorted Dry Fruits and 1 Rakhi, Roli Tilak and Chawal. Designer Pooja Thali (Thali Size 8 to 9 inch) with 500 Gms. (Gross Weight) Assorted Dry Fruits and 2 Rakhi, Roli Tilak and Chawal. Designer Pooja Thali (Thali Size 8 to 9 inch) with 500 Gms. (Gross Weight) Assorted Dry Fruits and 4 Rakhi, Roli Tilak and Chawal. Designer Pooja Thali (Thali Size 8 to 9 inch) with 1 Kg (Gross Weight) Assorted Dry Fruits and 1 Rakhi, Roli Tilak and Chawal. Designer Pooja Thali (Thali Size 8 to 9 inch) with 1 Kg (Gross Weight) Assorted Dry Fruits and 2 Rakhi, Roli Tilak and Chawal. Designer Pooja Thali (Thali Size 8 to 9 inch) with 1 Kg (Gross Weight) Assorted Dry Fruits and 4 Rakhi, Roli Tilak and Chawal.